In 1992 Bakersfield Bit & Tool started selling and shipping tools to international customers with a major focus on Indonesia. After an extensive field study and compared performance with other tools CalTex Indonesia chose the BB&T GaugeMaster “Driller” underreamer as the primary tool to be used in the Duri field. The BB&T GaugeMaster “Driller” has been used as the 1st choice tool since this time. 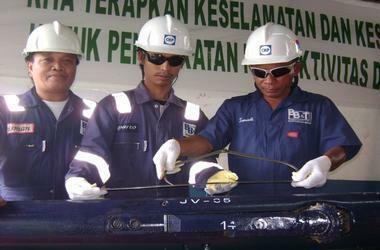 In 2001 after forming a Joint Venture between our agent PT CATUR KHITA PERSADA and BB&T a shop was established in Duri and we started offering the GaugeMaster “Driller” tool as a rental. The Duri repair facility and field service personnel have continued the quality and performance that has been a hallmark of the BB&T line of tools. Bakersfield Bit & Tool specializes in underreamers and section milling tools. Our patented revolutionary design for our GaugeMaster drilling type underreamer can selectively be used for underreaming or drilling as needed. All of our products have proven themselves as the premier tools in the industry for simplicity and down hole durability.